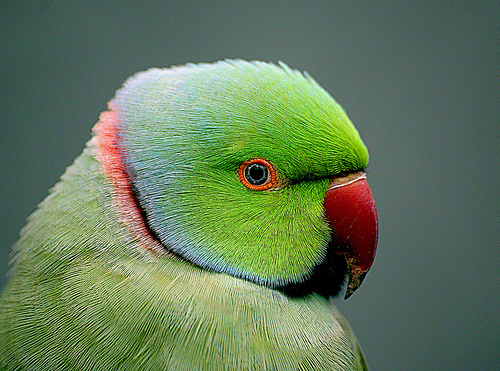 Pets Costs > How Much Does an Indian Ringneck Parrot Cost? How Much Does an Indian Ringneck Parrot Cost? The Indian ringneck parrot, also known as the Rose-ringed parakeet, is a tropical bird that can range in size and color. Popular as pets, the ringneck parrot can grow up to 16 inches long, with the tail can account for the majority of its length. These birds are native to Asia and Africa and are known for their ability to show off and even play a few games. The cost of an Indian ringneck parrot will often depend on the age, gender, the breeder selling it, the species, colors, its health and the geographical location. On average, the cost can range anywhere from $250 to as much as $1,200 for a rarer species and/or color. From our research, however, the average blue or green Indian ringneck parrot will cost $175 to $300, with females often costing 20 to 30 percent less than a male. On a forum thread on ParrotForums.com, forum members claimed they could find ringnecks ranging anywhere from $50 to as much as $1,000. BirdsNow.com, a popular online bird classified website, had close to 100 postings at the time of this writing. Here, the classified listings ranged anywhere from as little as $150 for an older nine-year-old bird to as much as $800 for a bright yellow juvenile baby. Reputable breeders will often hand feed the babies until they are ready for adoption and will slowly wean them off when you take them home. They should also come with some sort of health certificate from a licensed vet backed up by a health guarantee. Depending on the breeder, they may also be DNA tested to confirm the gender, but this isn’t always necessary as the bird can be defined by its colors. Before you’re able to take the bird home, a breeder will require a deposit, often $100 to $200 or a certain percentage of the sale price. Upon adopting, you will then have your deposit applied to the adoption cost. The diet of a ringneck will often include foods such as nuts, seeds, berries and even fruits. In addition, BirdFarm.com says you can also use pasta and some grains. Owners are often advised to set aside at least $30 per month to adequately feed each bird. Rarer species often have to be purchased outside of state lines. If you do not have the time or resources to pick the bird up, the costs of shipping one can often start at $150 and go up from there depending on how far and how it has to be shipped. Most cages, to adequately store the bird, can start at $200 and go up from there, depending on the setup you’re looking at. At a minimum, the cage should be 22 by 24 inches and should be stocked with toys to keep the bird entertained when you’re not around. This bird loves swings and shiny objects it’s able to chew on throughout the day. If bored, the bird has been known to resort to chewing the cage or even becoming quite destructive if left outside the cage. The male ringneck parrots will have a colored ring around their neck, while the younger birds and females will not have the ring at all. Some females can have a ring, but it will often be a pale, grayish color. Both will have larger tails with 12 feathers, and two of the largest tails, which are commonly blue, make up most of the parrot’s size, extending as long as eight inches. Because of their green colors, they can often be hard to find inside a cage when roosting or even inside a nest. Common colors found on the market include a shade of yellow, green, blue, albino or a mix between. Like most parakeets, the Indian ringneck parrot tend to be show-offs, great at playing games and even speaking more than a dozen words. The average lifespan, as long as its taken care of properly, can be as long as 40 years. Known for being extremely outgoing and social, this bird is often recommended to those who are first-time bird owners. Not considerably loud, these birds will do fine in an apartment or condo. If possible, try to adopt a bird within traveling distance. By adopting one locally, you will be able to avoid the shipping charges and can see the bird in person. Check out Craigslist or a similar classified website to see if an owner is offering a bird along with their supplies. Oftentimes, when an owner gives up an older bird for adoption, they will sell all of the supplies with the bird as well. Kiwi, a male green Indian Ringneck was given to us in 2001 because his owners had a houseful of cats. He is still with us and it’s important to offer them fruit every day and I believe the Zupreme colored pellets are what makes his feathers perfect. He also gets Higgins Sunburst seeds and dried fruit for Conures. He doesn’t talk and I believe at one time he was mistreated, but we love him.